A century ago, the Great War had just finished, but it wasn’t until 19 September that the last Raglan troops arrived on the troopship Hororata at Wellington. Other delayed troops rioted at Sling Camp in March 1919 and some didn’t return until 1921. 75 local men went to the front, of whom 54 returned. In October the Town Board Chairman presented them gifts from the Soldiers’ Reception Committee at a social and dance, then in November a ball welcomed returned Masons. There was a national referendum in April 1919 on alcohol. Raglan, Te Mata, Te Uku and Waitetuna voted for prohibition, but Te Akau for continuation. Nationally it was the returning troops who swung the vote for continuation. One of those returning, Charlie Brewerton, felled bush on a 700 acre block at Makomako. He was not the only one felling bush. When Te Uku hall was built as a war memorial, timber for it was felled on Karioi, and milled at Te Mata. Much felling was resumed after the war and the Raglan Sawmilling Co was formed to mill the timber around Karioi, especially rimu. In 1919, Papahua, most of which is now public domain, was awarded to Ngāti Mahanga by the Native Land Court, which concluded their conquest was an established historic fact. Raglan Town Board had, in May 1917, wanted to buy it for a Recreation Reserve, which it became in 1923. The Court said Papahua was a comparatively valueless piece of land and that money shouldn’t have been wasted on a court case. 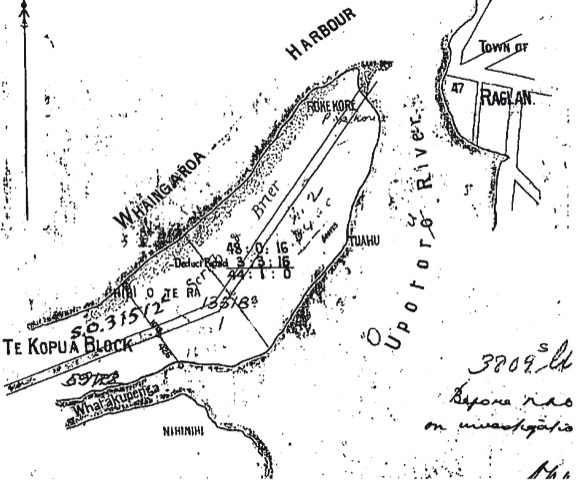 The above plan of the area is in a Waitangi Tribunal report, History of pre-1865 Crown Purchase Reserves in Te Rohe Pōtae. It is one of two reports setting out the complex history of local land transfers and concludes that most reserve sales were, “characterised by varying degrees of administrative confusion”. Progress was at last being made, with financial support from the government (£4500 spent in 1919 – almost $½m today), to turn the muddy track between Raglan and Frankton into an all weather road, with sand and gravel from Te Uku Quarry, Belcher’s Quarry (now on Cornwall Rd) and the beach. Metalling had begun in 1908, about 4 of its 31 miles remained as mud in 1919 and it was finished in 1921. Slips were frequent on the new deviation in 1919. There was debate about who should pay for the locally rated half of the cost. 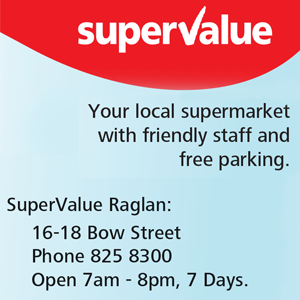 It was claimed 80% of traffic was from outside Raglan, with only 10 cars in Raglan (no parking problem! ), so locals shouldn’t pay to maintain the road for visitors. It was expected that within 2 years there’d be a “good road” to Te Mata. Other roads listed as getting government money were Aotea to Raglan, Waingaro to Ruakiwi Landing, Waipa Bridge and Wallis St. South from Te Mata, Pakoka bridge didn’t open till 1923, so when the Public Works Department cut a 6-foot track for 9 miles through solid bush to Makomako Rd, it was used to get stock to market. Its use declined once the bridge opened and it is now an eroded and overgrown track. 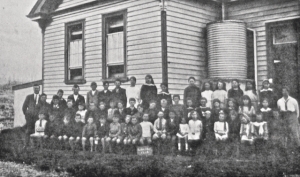 A 1919 photo of Te Mata School shows 53 children. Raglan’s regular bus service started in 1919, when 1918’s, “prospect that with the beginning of the year a daily mail service will be established between Raglan and Frankton” was planned to become reality on 1 October 1919. However, the start was delayed to the end of the monthwith an ad saying, “Until the road is reliable, Casual Trips will be taken”. Possibly the caution was prompted by the mail car tumbling, “between 50 and 60 feet”, when it swerved to avoid another car on a tight bend at the top of the divi in February 1919. Fortunately the worst injury to the 8 passengers was a broken collar bone. Initially there were several competing ‘service cars’, all using large US-built cars, either Hudson, or Chevrolet and taking about 3 hours. Les’ father, Edward Houchen, was chair of a railway group. A large meeting at Te Uku was reported to, “view with favour the proposal to construct a light railway from Hamilton to Ragland and Kawhia” and another line from Kawhia, via Te Kawa, to Otorohanga was also promoted in 1919. Like the road, it would have taken about 3 hours to Hamilton, at speeds of 10 to 14mph. Water transport was still important too. Te Akau wharf was completed, the Raglan wharf approaches nearly finished, and, “two rows of concrete piles on the wharf erected and will be out of the contractor’s hands before Easter. At dead low water there will be 12½ft at Te Akau, and 14½ft at Raglan, which will be ample to accommodate any vessel likely to enter the harbour.” However, wartime shortages intervened, so the present wharf didn’t open until 1921. They also further delayed repairs, so, “10 feet of the retaining wall at the launch wharf . . . collapsed and required immediate attention”. Every Monday the Northern Steamship’s Aupouri, Rimu, or Claymore continued to leave Onehunga for Raglan and Kawhia and the annual fishing excursion was on Tuesday 18 February on the Rimu, though for schnapper, not hapuka, “which has not been too successful from the fishermen’s point of view for two or three years.” The 6-hour trip cost 10s (around $50 today) and afternoon tea was 1s ($5). 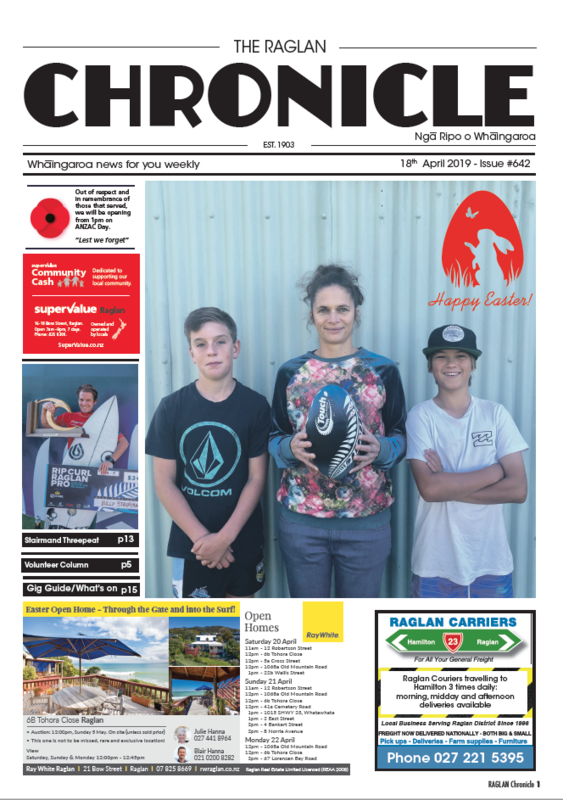 The road improvements resulted in, “an exceptionally large influx of visitors from all parts of the Waikato since Christmas, and it is evident that Raglan has now become the seaside resort for Waikato. Quite a number of ‘shacks’ have just been finished, while several others are in course of erection, residents of Hamilton, Cambridge, Te Awamutu, Ngaruawahia and Frankton all being represented. . . 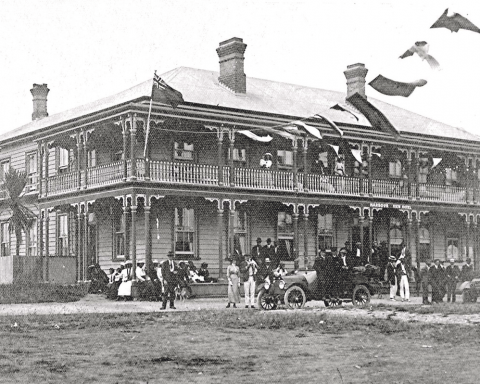 The town of Raglan is filling fast with holiday makers and the hotels and boarding houses are being besieged. Numerous tents are cropping up like mushrooms in sheltered places.” One Hamilton investor bought up lots of residential sections. A case of tutu honey poisoning in May showed that communication was still slow. Bill Richards in ‘Off the Sheep’s Back’ described how it took from 9pm till late afternoon next day to get the doctor from Ngāruawāhia and he had to stay, as they couldn’t get the sick to hospital. They had no phone, so went to a neighbour, but, as the exchange closed at 5 pm, they rang someone 3 miles from it, who went there get a call through. Then the doctor’s car stuck in mud, so he had to walk the last 7 muddy miles. Bill Richards also described the lobbying for Ruakiwi School, which cost £319 in 1919. With poor transport and large families, local schools were needed. For example, at the general election in 1919, Te Mata cast a total of 98 votes (51 for Reform, 39 Liberal, 8 Labour – Richard Bollard was Raglan MP from 1911 to 1927, when Labour got in), but the below 1919 photo of Te Mata school shows 53 children. So 1919 left us with less bush, a pub, a school (closed when school buses spread) and a bus service. The 1920s would bring many more changes.